The historical Buddha openly disagreed with many of the teachings of the Brahmins, Jains, and other religious people of his day. Nevertheless, he taught his disciples to respect clergy and followers of other religions. Further, in most schools of Buddhism aggressive proselytizing is discouraged. Proselytizing is defined by dictionaries as attempting to convert someone from one religion or belief to another, or arguing that your position as the only correct one. I want to make it clear proselytizing is not the same as simply sharing one's religious beliefs or practices without trying to "push" them or force them on others. I'm sure you're aware that some religious traditions insist on proselytizing. But going back to the time of the historical Buddha, our tradition has been for a Buddhist not to speak of the Buddha dharma until asked. Some schools require being asked three times. 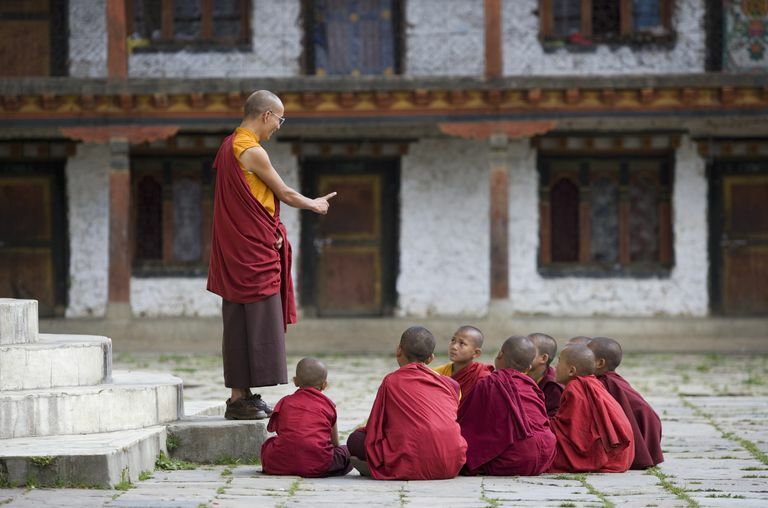 The Pali Vinaya-pitaka, rules for the monastic orders, forbids monks and nuns from preaching to people who seem disinterested or disrespectful. It's also against the Vinaya rules to teach people who are in vehicles, or walking, or who are sitting while the monastic is standing. In brief, in most schools it's bad form to go about accosting strangers on the street and asking if they've found Buddha. I've been in conversations with Christians who are completely baffled by the Buddhist reluctance to proselytize. They see doing whatever it takes to convert people as an act of charity. A Christian said to me recently that if Buddhists don't want to share their religion with everyone they possibly can, then obviously Christianity is the better religion. Ironically, many of us (me included) take vows to bring all beings to enlightenment. And we very much want to share the wisdom of the dharma with everyone. From the time of the Buddha, Buddhists have gone from place to place making the Buddha's teaching available to all who seek it. What we -- most of us, anyway -- don't do is attempt to convert people from other religions, and we don't try to "sell" Buddhism to people who are not otherwise interested. But why not? A text in the Pali Sutta-pitaka called the Ayacana Sutta (Samyutta Nikaya 6) tells us that the Buddha himself was reluctant to teach after his enlightenment, although he chose to teach anyway. "This dharma is deep, hard to see, hard to realize, peaceful, refined, beyond the scope of conjecture, subtle, reachable even to the wise only through experience," he said to himself. And he realized people would not understand him; to "see" the wisdom of the dharma, one must practice and experience discernment for themselves. In other words, preaching the dharma is not just a matter of handing people a list of doctrines to believe. It is setting people on the path to realizing dharma for themselves. And walking that path takes commitment and determination. People won't do it unless they feel personally motivated, no matter how hard you "sell" it. It's better simply to make the teachings available to people who are interested and whose karma has already turned them toward the path. It's also the case that proselytizing is not exactly conducive to inner serenity. It can lead to agitation and anger to be constantly butting heads with people who disagree with your cherished beliefs. And if it becomes important to you to prove to the world that your beliefs are the only correct beliefs, and it's up to you to lead everyone else out of their erroneous ways, what does that say about you? "Do not think the knowledge you presently possess is changeless, absolute truth. Avoid being narrow minded and bound to present views. Learn and practice nonattachment from views in order to be open to receive others' viewpoints. Truth is found in life and not merely in conceptual knowledge. Be ready to learn throughout your entire life and to observe reality in yourself and in the world at all times." If you're marching around certain that you are right and everybody else is wrong, you are not being open to new understanding. If you're marching around trying to prove that other religions are wrong, you are creating hate and antagonism in your own mind (and in others). You are corrupting your own practice. It's said that the doctrines of Buddhism should not be grasped tightly and fanatically, but held in an open hand, so that understanding is always growing. The Emperor Ashoka, who governed India and Gandhara from 269 to 232 BCE, was a devout Buddhist and benevolent ruler. His edicts were inscribed on pillars that were erected throughout his empire. Religion-pushers ought to consider that for every one person they "save," they are likely turning off several more. For example, Austin Cline, About.com's Agnosticism and Atheism expert, describes how aggressive proselytism feels to someone who really is not in the mood for it. This also goes back to how proselytizing can corrupt one's own practice. Objectifying people is not loving kindness. I want to come back to the Bodhisattva Vow to save all beings and bring them to enlightenment. Teachers have explained this in many ways, but I like this talk by Gil Fronsdal on the Vow. It's most important to not objectify anything, he says, including self and other. Most of our suffering comes from objectifying the world, Fronsdal writes. And one can't very well live in the conceptual box I'm right and you're wrong without objectifying all over the place. "We are concerned with letting our whole response to the world arise out of being rooted in the present," Fronsdal said, "without an objective me in the middle, and without an objective other out there." Keep in mind also that Buddhists take a long view -- failure to wake up in this life is not the same thing as being cast into hell for all eternity. Even though the teachings of the many religions are very different from each other and often in opposition to each other, many of us see all religions as different interfaces to (possibly) the same reality. The problem is that people mistake the interface with the reality. As we say in Zen, the hand pointing to the moon is not the moon. But as I wrote in an essay awhile back, sometimes even God-belief can become an upaya, a skillful means to realizing wisdom. Many doctrines other than Buddhist doctrines can function as vehicles for spiritual exploration and inner reflection. This is another reason why Buddhists aren't necessarily distressed by other religions' teachings. "If you do adopt Buddhism as your religion, however, you must still maintain an appreciation for the other major religious traditions. Even if they no longer work for you, millions of other people have received immense benefit from them in the past and continue to do so. Therefore, it is important for you to respect them." The Search for Original Buddhism: A Noble Quest or a Fool's Errand?